Seminars and courses for ham radio operators are held in a club station. For amateur radio users, radios are not only used for listening to radio programs. They are also a channel for personal contact and tools for constructing their own communication systems. 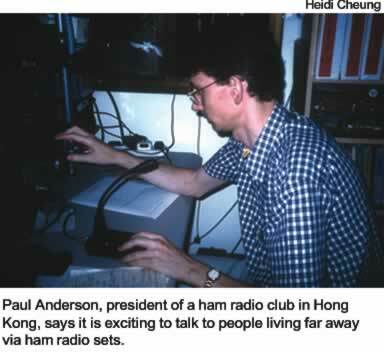 “We use amateur radios for leisure to produce our own experimental phone systems,” said Paul Anderson, president of Hong Kong Amateur Radio Transmitting Society. Mr. Anderson has great satisfaction when he successfully contacts people living far away. Besides, he feels excited to have connections with countries like Singapore, where amateur radio — or ham radio, as it is known colloquially — is highly regulated by the government. According to Mr. Anderson, ham radio has developed much since during the Second World War. Soldiers were trained to be radio operators. After the war, some of them constructed their own radio communication systems. Ham radio became popular because, at that time, telephone communication was expensive and restricted to big cities. He said that it was meaningless to compare amateur radio with other communication tools, like telephones. 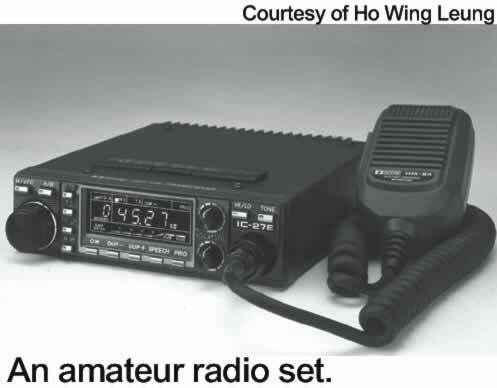 Stephen Tse, secretary of Hong Kong Amateur Radio Transmitting Society, said the dynamic unpredictability of ham radio is its main attraction. “There are a lot of variations I cannot predict,” said he. “For example, I do not know when calls will be answered and who is on the other side. Apart from its leisure function, amateur radio can also serve the public. They are usually used as a backup means of communication in mountaineering and charity walks such as Trailwalker, which is organized annually by Oxfam Hong Kong. “Charity walks are often held in country parks, where mobile phones don’t work well. Besides, phone lines may be busy when too many people use phones,” Mr. Anderson said. Mr. Tse said, “There was an unexpectedly heavy rain during Trailwalker 2000, and it caused a landslide,” he said. “Fifteen people were trapped on Tai Mo Shan and some of them had fevers. “The radio system of Mountain Rescue Team of Civil Aid Service and mobile phones could not work. Because Hong Kong Amateur Radio Transmitting Society is busy helping the public, it needs government assistance to find a place to centralize operations. “We are not asking for financial support,” said Mr. Anderson. “We only hope that the government can provide us with a place for a club station,” said Mr. Anderson. “We cannot afford to rent an office,” said he. “Since our society is a volunteer organization, our operation costs are supported by members. Ho Wing Leung, president of Hong Kong Amateur Radio Association, also supports this request. “A regular place would allow members to gather. They could share experiences and make improvements on radio operations,” said Mr. Ho. Other than the problem of finding a place, amateur radio operators have to deal with signal transmission difficulties. “There are lots of tall buildings in Hong Kong,” Mr. Ho said. “They block signal transmission. “Basically, antennae allow better signal transmission,” Mr. Tse said. “However, they are too big to be installed outside windows of common flats. In order to solve the problem, repeaters have been set up. Repeaters receive signals sent from one place and then retransmit the signals to targeted place. “Signals can farther this way. More people can be involved in communications as a result,” Mr. Ho said. According to Mr. Anderson, each radio user has a unique call sign that consists of six characters. The three-character prefix of a call sign represents the country, and the three-character suffix represents the specific user. “For example, ‘VR2’ represents Hong Kong, and I choose ‘BBC’ as my suffix,” Mr. Anderson said. “Therefore, my call sign is ‘VR2BBC’. After each radio communication, users usually exchange communication confirmation cards. The cards serve as proof of the radio communications made. Different cover designs of confirmation cards are allowed, provided that they include the call signs of the two parties, times and dates of the communication, frequencies used in the communication, modes of communication and the signal reports. People interested in operating amateur radios have to apply for an Authority To Operate License, and those interested in owning radio sets have to apply for an Amateur Station License. There is no direct relation between two licenses. Both are issued by Office of the Telecommunications Authority, and they can be applied for separately. Both licenses are classified into three types: restricted operation class, intermediate operation class and full operation class. Each level of the two licenses has the same examination requirements. 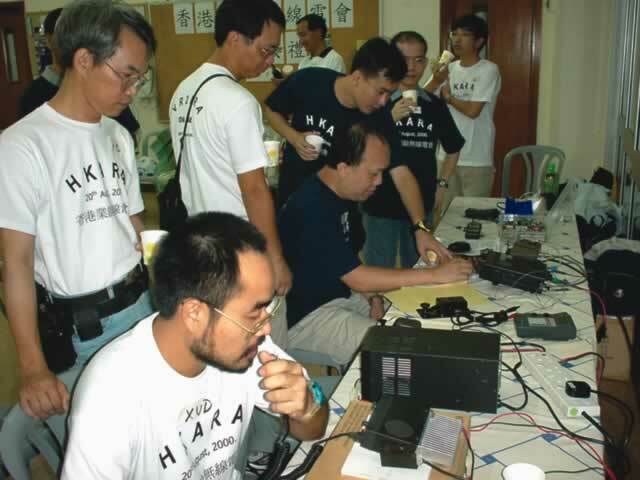 To achieve the restricted level, people have to pass the Hong Kong Radio Amateurs’ Examination, which is a written test. For the intermediate operation and full operation levels, applicants have to pass the Hong Kong Amateurs Morse Test, which is a technical test. People on the intermediate level must be able to finish coding at least five words into Morse Code per minute, and those finishing at least 12 words per minute can pass the full operation level. The Hong Kong Institute of Vocational Education in Tsing Yi is the authorized examination center for the two tests.